Visitors to Yosemite National Park can choose from a wide variety of dining facilities and services. Food services within the park are provided by Yosemite Hospitality LLC, a subsidiary of Aramark, an authorized concessioner of the National Park Service. For a quick review of dining options in Yosemite, see the concessioner's Dining page. The following food services are available in Yosemite Valley. Follow the links for more information. The Ahwahnee Majestic Yosemite Dining Room: fine dining all year in a grand historic hotel. Casual attire except for dinner, when more dressy attire is requested. Reservations are required for dinner and recommended for breakfast and lunch: 209.372.1489. Ahwahnee Majestic Yosemite Bar: offers a full array of beverages, served inside, on the terrace, or at the pool. 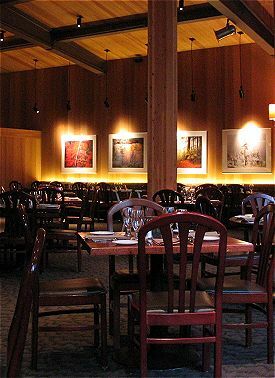 Yosemite Valley Dining Room: Open daily all year for dinner with a wine list and full bar available. Casual attire. Reservations are recommended for dinner: 209.372.1274. Yosemite Valley Lounge: Open daily for cocktails and light bar fare. Curry Village Half Dome Village Pavilion: Serves all-you-can-eat buffet service for breakfast and dinner daily from late March to November; weekends and holidays from December to mid-March. Beer, wine, and cocktails. Other options: Options include Pizza Deck, Meadow Grill, Coffee Corner, and Half Dome Village Bar. Other options: Options include Degnan's Deli, open all year, and in season Degnan's Loft, Degnan's Cafe, and the Village Grill. Happy Isles Snack Stand: Summer only. Ice cream, beverages. The following food services are available outside Yosemite Valley. Follow the links for more information. Wawona Hotel Big Trees Lodge Dining Room: Breakfast, lunch and dinner are served daily when the hotel is open. A hearty Sunday brunch is served weekly from Easter through Thanksgiving and during the Christmas Holidays. Casual attire. For reservations call 209.375.1425. Other options: Options include the Wawona Hotel Big Trees Lodge Summer Saturday BBQ, the Wawona Hotel Big Trees Lodge Golf Shop Snack Stand, and cocktail service. 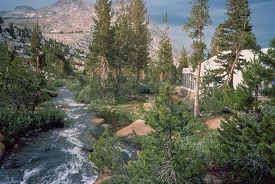 Tuolumne Meadows Lodge: Summer only. Breakfast and dinner. Casual. Reservations are required for dinner; call 209.372.8413. White Wolf Lodge: Summer only. Breakfast and dinner. Casual. Reservations are required for dinner; call 209.372.8416. High Sierra Camps: Summer only. Breakfast and dinner are available on a space-available basis to backpackers camping near the High Sierra Camps. Reservations for meals are required in advance: 559.253.5674. Glacier Point Snack Stand: Summer and fall only. Hot dogs, sandwiches, beverages, snacks.